This area of the house has been completed for awhile now, but the craziness of life has made this post a little late. Ashford, Shaun, and I all had birthdays in June, and then Zach fell off a slide and broke his arm! Unsurprisingly, we've been using this appliance an awful lot lately. We knew almost upon moving in that this area would be a great kegerator spot. 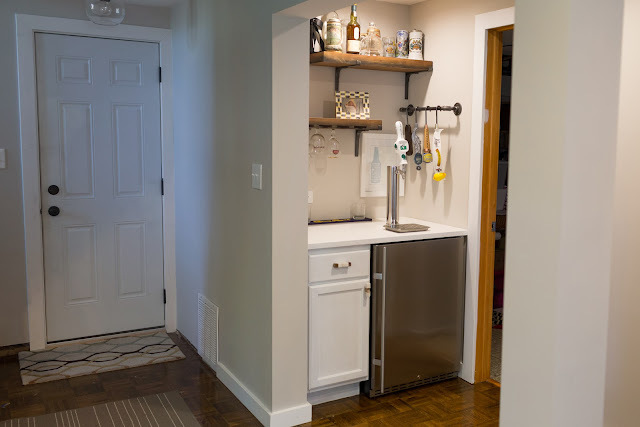 We really could've used another closet, but what is better....more space to hold crap you forget about, or tap beer? As I said in my post last July, PRIORITIES. We still need to add trim under that cabinet, but for now the white paint on the toekick is a great disguise. 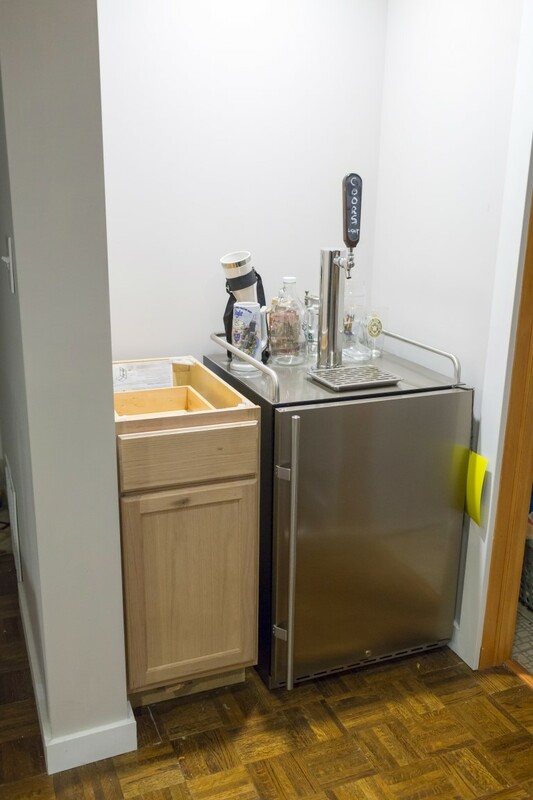 We got the kegerator from kegerator.com. Very unique name, I know. It was very exciting when it arrived! I got a 15" base cabinet from Home Depot and promptly put it there to pretend like everything was done. Then I realized that I couldn't take on this project myself, mostly because I don't install stone counters, but also because our children are stage 5 clingers and I needed professional help. I called a 'handyman' company I've used in the past, and they gave me a quote I could live with. For $1000, we got the cabinet installed and preparation for counter, quartz countertop, counter installation, a new outlet, shelves hung, and all touch ups done. I am in love with the quartz! The color is Wilsonart 'Haida' and it is very simple and pretty. 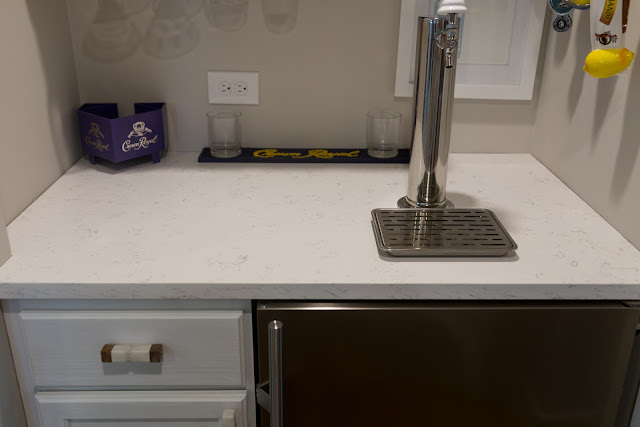 Marble-esque, but really just very soft and neutral white with black/gray veining. I haven't decided if I will caulk the edges yet, for now it looks great. I painted the cabinet with our Behr Ultra Pure White trim color, and got some fun hardware from Anthropologie. For the area above the counter, I opted for these 'Vigneto' shelves from Ballard. 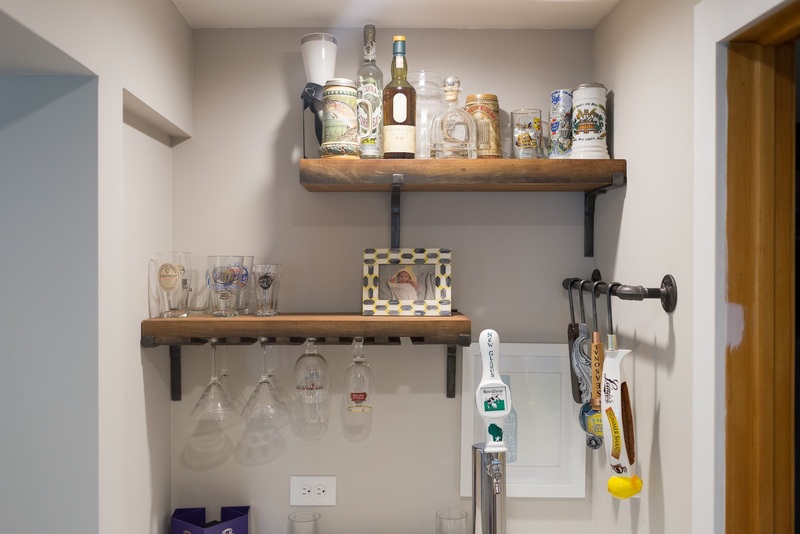 The top shelf holds a lot of vintage steins from Shaun's grandpa, and fancy liquors we never drink. 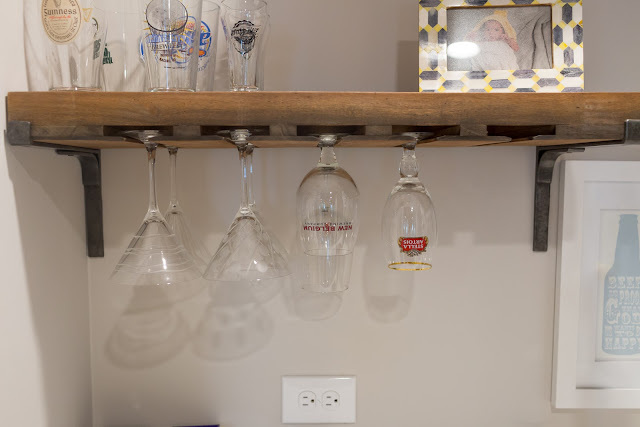 We ended up with this off-kilter arrangement because the stud was directly in the middle, and we couldn't put the bracket for the wine glass shelf in the middle due to the glass holders. I was initially annoyed, but I think the rustic look of the shelves makes it look ok. Since the bottom shelf is not in a stud on the right, we opted for a light picture frame and no glasswear on that side. (I have no idea what to put there, so baby Zach in a towel after a bath is as good as anything - considering he is the reason I drink!) I was most excited about the tap handle holder. 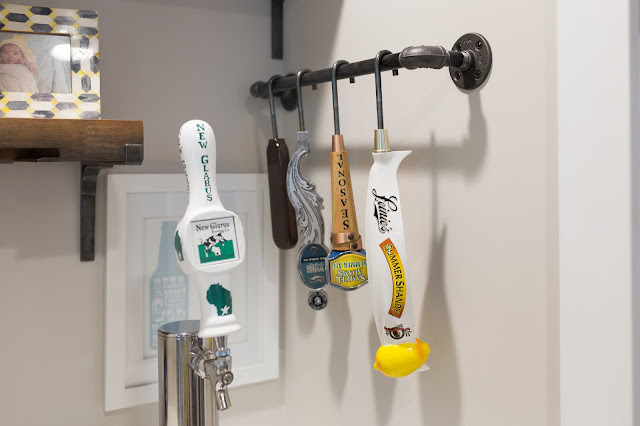 We went to a local bar that had a similar pipe-inspired tap handle holder, and the idea really appealed to us. I got this 18" pipe towel bar from Etsy, and then went about finding the right hooks to use for the handles. It wasn't easy, the bar was thick and the threads to go into the handles had to be right. I ended up finding a 'clothesline' hook at Ace that worked, but it was rather long. I just sprayed them with Rustoleum 'Black Night Metallic' spray paint to match the galvanized pipe better. 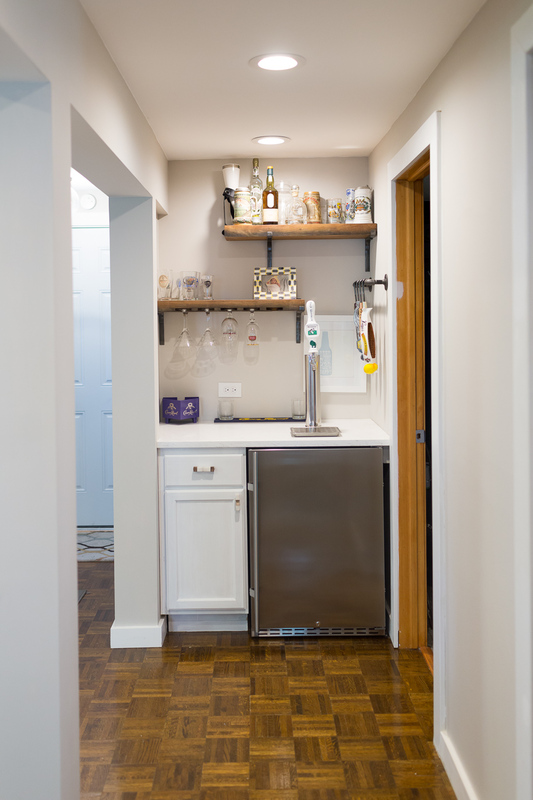 I really love the outcome, and we have room for a few more handles of beers we get often. I hung the print we've had since Russet street in this area, I still love it and I'm glad it found a home. The wine glass shelf is great, but we really don't use it for wine glasses. Those live upstairs, because we drink wine on the couch in our living room. Often. 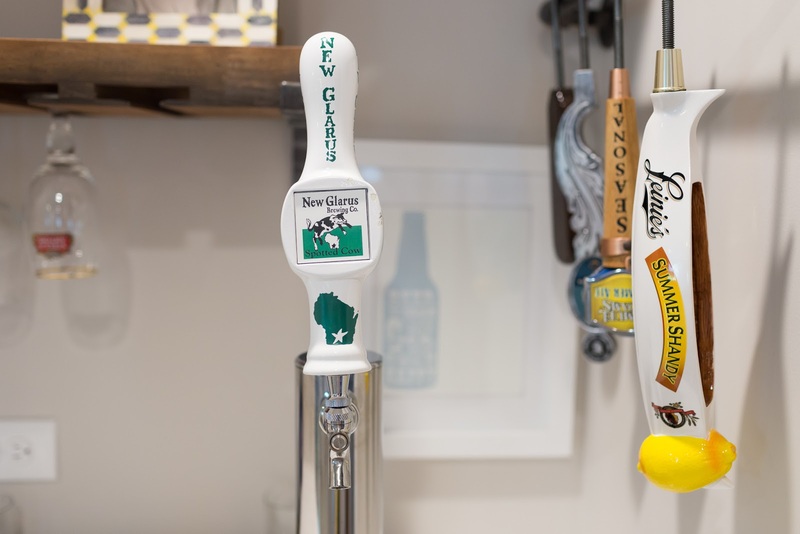 Being from Wisconsin, I'm a huge New Glarus fan. My awesome brother got me this used tap handle and a pony keg of Spotted Cow for my birthday, and it was the perfect gift! If you've never had Spotted Cow, go to Wisconsin (it's only sold there) or have a friend pick you up a pack. So good! Overall, I'm very happy we did this project, and it really has given us a lot of joy and fun while entertaining. When people don't know we have it, and come down the stairs, it's amusing to see their eyes light up when they look behind them. I feel it was well worth the $2400 we put into it. And obviously, it could be done for much cheaper if you have the time and skills to do all the labor! 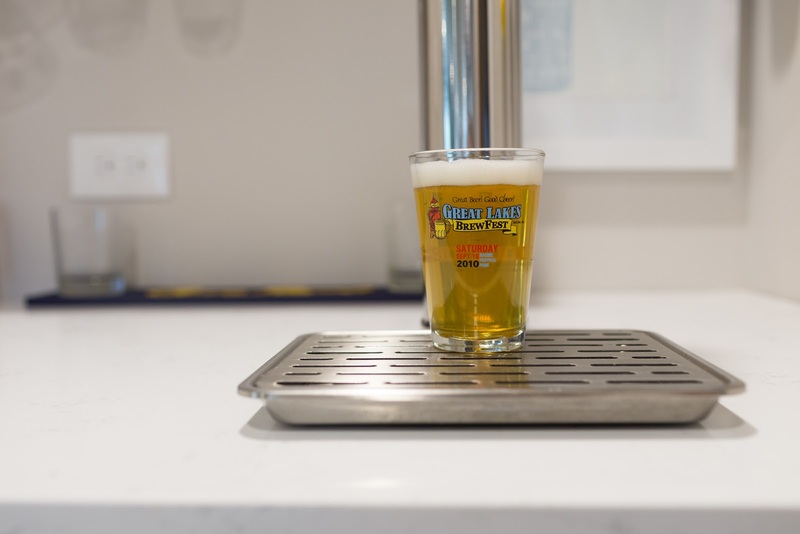 It's also totally awesome to pour myself a tiny beer whenever I like. Let's be honest, some days are 'it's 5 o'clock somewhere' days. Ok, most days are. I can safely say I have at least 8 ounces of beer daily. It is a small indulgence to look forward to! 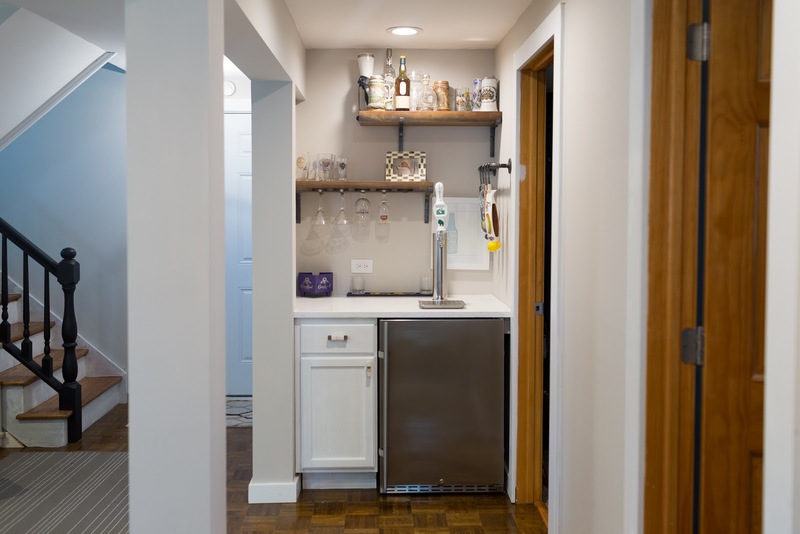 I hope this post has inspired you to create a little beer nook in your house! Your friends will thank you. I will thank you when I come over. By the way, invite me over. I need to talk to adults! 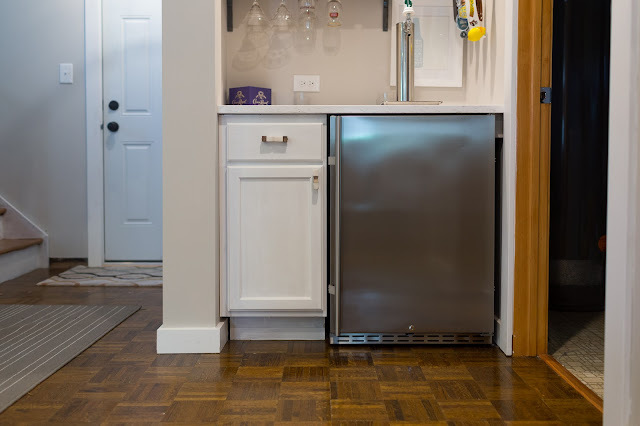 Is there a drain on the kegerator? What happens when the beer overflows. It looks very nice and fits so nicely in that spot. You have a talent for styling. Thanks, Gigi! There isn't a drain, but the beer is totally contained and can't overflow. It's possible someone could leave the tap handle down, in which case we'd have a lot of ruined parquet to replace. Thanks for your nice comment! I absolutely love this little detail in your house. I've thought about it often, since you showed the start of it last July. 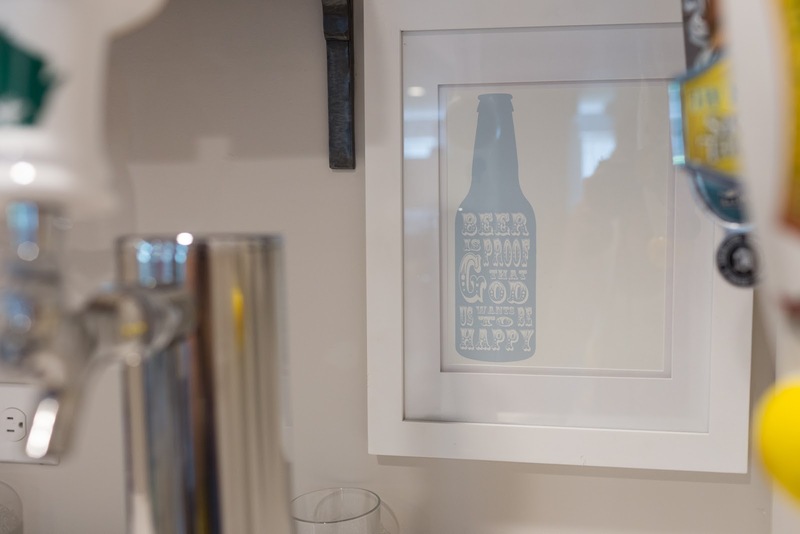 My husband is not a drinker, but I am a beer fan. I'm boring though, I like Bud Select. My grandfather and my father both spent their entire careers at Anheuser-Busch, so beer is a reoccurring theme with our family! Awesome! We both love beer, it's a real bonding thing. So cool it's in your family! 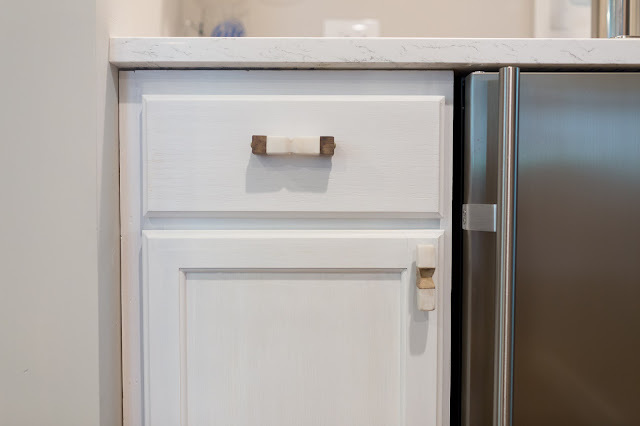 Totally love this feature in your house. I would only have the Shandy pull though. The crazy area rabbits are here too and they are driving the dog bonkers! Happy Birthday late. The house across the street from us is your same model and they are selling. I knew the previous owner, and the new realtor.com shots have show the work they have done to it. I can send you a link if you want to see the inside of their split level. I know it feels like this stage of parenting is lasting FOREVER, but it will pass. So sorry about Zach's arm. Hydrate, hydrate, hydrate. I think you did such a great job with this spot! The bar to hold the tap handles is very clever! 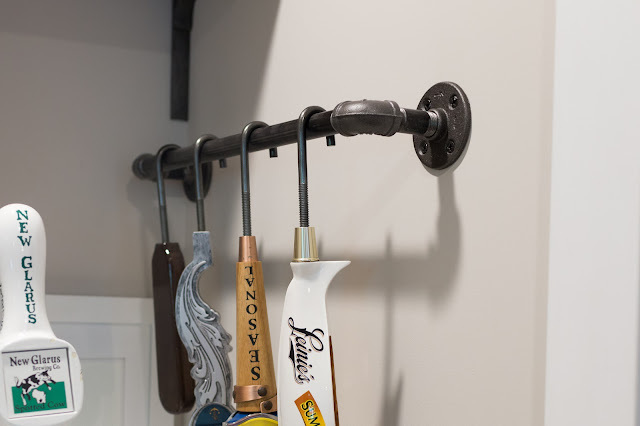 I am more of a liquor kind of gal so it took me a while to figure out why you would have the different handles. Poor baby and mama to have to go through the broken arm! Three cheers to alcohol!